How important are good financial strategies and processes for your business? Of course they are very important. The goal of the Finance Polices and Procedure Manual is to assist you with key aspects of financial operations that include regulatory compliance, improving performance (through well-defined processes) and implementing best practices into operational areas like Raising Capital and Treasury Management. The Finance field is broad, complex, and dynamic, so that no document can claim to be absolute in capturing every possible issue, policy, or procedure and remain current. The concepts discussed in the manual cover the common, basic elements of a Finance Management System. 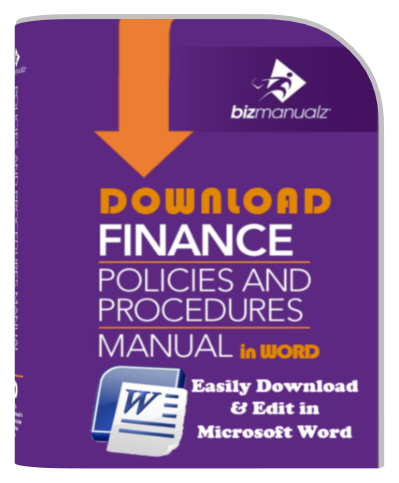 Finance Policies Procedures Manual Template Solution in MS-Word. Use the Financial Policies and Procedures Manual to quickly establish consistent financial statement treatment, treasury management, strong financial auditing and internal controls to manage capital. Implement consistent standards based on standard best practices that help you comply with regulatory requirements. Download your set of easily editable Microsoft Word documents. Finance is a technical field. A number of terms are used throughout the Financial Policies and Procedures Manual. Those financial terms commonly used within a Finance Department are defined in this glossary. A document (also called a charter) filed with a U.S. state by a corporation’s founders, describing the purpose, place of business, and other details of a corporation. A management system organized around balancing four distinct business perspectives: financial, customer, internal, and innovation/learning; Balanced Scorecards seek to balance short and long term objectives, financial and non-financial measures, lagging and leading indicators, and internal and external perspectives. Individuals elected by a corporation’s shareholders to oversee the management of the corporation. The president reports to the Board of Directors. The period or phase of a business usually defined by its potential for growth and profitability. For example, businesses are not typically profitable in their initial phase but have tremendous growth potential. On the other hand, while mature businesses may no longer be capable of rapid growth rates, they are often more profitable than when they were new. The rules that govern the internal affairs or actions of a corporation. Bylaws generally include procedures for holding meetings and electing the board of directors and officers. The bylaws also set out the duties and powers of a corporation’s officers. A business taxed as a separate entity: a business taxed under Subchapter C of the Internal Revenue Code and legally distinct from its owners. The senior manager of the Finance Department. The CFO reports to the Company’s Chief Executive Officer (CEO). A practice by which the mundane and non-controversial board action items are organized in a group and passed with one motion. Disaster Recovery Plan to ensure that the effects of an extended disruption (e.g., natural disaster) are minimized and the organization is able to maintain or quickly resume mission-critical functions. Document that provides information or direction for performance of work within the scope of the FMS. Characteristics of control include such things as revision number (letter), signatures indicating review and approval, and controlled distribution. Information and its supporting medium; the medium may be paper, magnetic, electronic, optical, photograph, or a sample of the Company’s product. Duration of an equipment or system stoppage, scheduled or unscheduled, measured from the moment of failure to the moment at which normal operations resume. Document originating outside the Company (e.g., customer drawings, industry and/or international standards, suppliers’ equipment maintenance manuals, or references) that provides information or direction for performing activities within the scope of the FMS. System of managing the Company’s financial resources, including accounting and financial reporting, internal controls, budgeting, collecting accounts receivable, risk management, and insurance. The FMS for a small business includes how you are financing the business and how you manage its money. Ordered, well-documented system of policies, processes, and procedures, designed to assure compliance, conformity, and security; demonstrate a system of internal controls; and promote continual improvement of financial processes. Clearly expressed and specific objectives (i.e. expressed in numbers, percentages, ratios) of the Company as they relate to its financial operations and financial structure. Printed, typed, or electronic document with blank spaces for insertion of required or requested information (e.g., tax form, order form). Document or web form with spaces in which to write; business document that typically contains some predefined data and designated, labeled areas for filling in data. Document of internal origin (developed entirely by or completed by the Company) that provides information or direction for the performance of activities within the scope of the FMS. Examples include, but are not limited to, FMS procedures. Indicator of past performance, such as actual sales over a period. Indicator of future performance (e.g., an increase in interest rates is often a leading indicator of reduced consumer spending). Consists of the CEO, CFO, and Finance department managers, at a minimum. Process or series of acts involved in a particular form of work; detailed elements of a process used to produce a specified result. Procedures are different from work instructions. Procedures document a process. Lower level detail of activities or tasks are documented within a work instruction. The minimum number of people who must be present at a stockholders’ meeting, physically or by proxy, in order for a decision made at such a meeting to be binding. The quorum requirements should be stated in the Company’s bylaws. Anything retained to provide and preserve permanent evidence of or information about an event (e.g., document, photograph, nonconforming product sample). An official document representing an action or intent of action on the part of the Board of Directors of a corporation. An acronym that describes important attributes for objectives: Specific, Measurable, Attainable, Relevant, and Time-Bound or SMART. One who owns shares of stock in a corporation (also called stockholder). Ownership includes the right to declared dividends and to vote on certain company matters, including electing the Board of Directors. Generally, a group of Company officers (e.g., chief executive officer (CEO), Chief Financial Officer (CFO)) with primary responsibility for decisions and activities affecting the Company in the long term (e.g., strategic planning); may also be referred to as “senior level management”. Document that is not a part of the controlled document system. Uncontrolled documents may not be used to provide work direction or information necessary for the performance of work. For a step in a process, the instruction(s) on how to perform that step, sufficiently detailed to allow an inexperienced person to perform the work. See Difference Between Process, Procedures and Work Instructions.